Made from just one piece of Saffiano vegan leather, this minimalist wallet is purposefully pared down to carry only the essentials—cards and cash. The slim design fits easily into pockets and has oiled edges to stand up to wear and tear. Dimensions: 2.5" x 3.5" x 0.2"
Good for size conscious guys. I was a bit skeptical whether I could pare down and use this small wallet. But my two brother in laws use something similar and I thought I'd give it a try. I was pleasantly surprised and now carry the Dash every day. My only complaints are that I could used room to carry one more CC and it might help to either expose a little more of the CC or make it a little looser so you can get the cards out easier. I have to slip my finger down into the pouch and it's not always easy to get the top CC out. FYI, I can carry my DL, insurance car, AAA card, three CC and some cash. Usually plenty and I don't even feel the Dash in my pocket. Whether you’re traveling abroad or running errands, Dash Wallets range from a passport holder to a barely-there billfold. And every design streamlines bulk out of pockets and bags. After a dog named Dash chewed up Founder Steven Ng’s wallet, he looked for one that fit his minimalist sensibilities and came up short. So he started innovating his own. After a successful crowdfunding campaign, Steven started Dash. 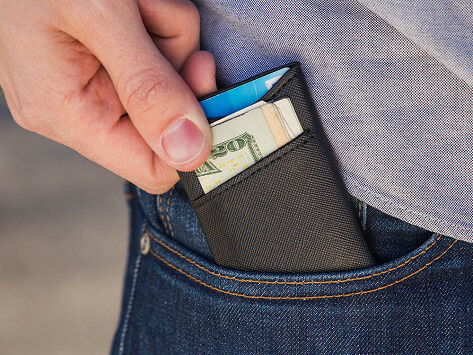 Each is made from durable, vegan leather with designs that let you get to cards and cash fast, then fit smoothly back into pockets. Features like oil-coated edges and a cross-hatch finish help them stand up to wear and tear. And the larger travel wallet is enhanced with RFID protection—with space for your passport and travel documents, like boarding passes. And to think, a dog is to thank for inspiring these solidly constructed, thoughtfully pared down designs.